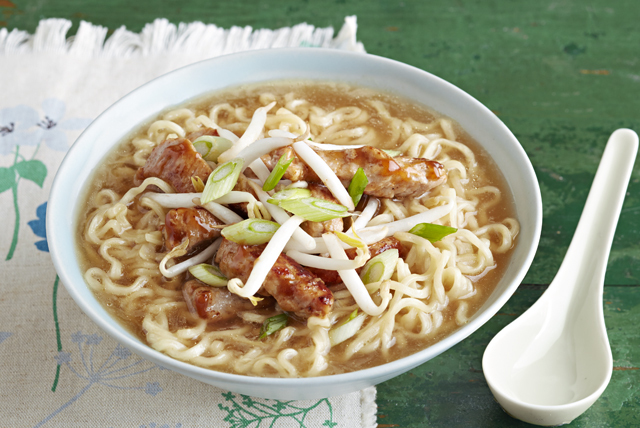 Try out our simple Barbecue Pork Noodle Bowl recipe this evening. This Barbecue Pork Noodle Bowl is seasoned with sesame dressing, soy sauce and lime. Remove 1 Seasoning packet from soup mixes; discard or reserve for another use. Cook Noodles with remaining seasoning packet as directed on package. Meanwhile, heat oil in large nonstick skillet on medium-high heat. Add meat; cook and stir 2 min. or until done. Remove from heat; stir in barbecue sauce. Add dressing, soy sauce and lime juice to soup; stir. Ladle into 4 bowls; top with meat, sprouts and onions. Substitute nam pla (fish sauce) for the soy sauce.